Given the climate of rising rates — and the degree to which rates have shown their ability to back up on fears of the eventual quantitative easing (QE) withdrawal — we believe term structure risk is best avoided in favor of sectors with more attractive risk-and-return profiles. In the second quarter of 2013, the debate over the end of QE became the focus of markets globally, which culminated in June with a statement by Fed Chairman Ben Bernanke on the economically driven prospects for curtailing the Fed’s bond-buying programs. This marked what may prove to be a critical inflection point for the Federal Reserve, the U.S. economy, and global securities markets. The market’s reaction to this potential change was anything but calm. Across most fixed-income markets, bond yields rose, spreads to Treasuries widened, and bond prices fell. The yield on the 10-year Treasury note, for example, backed up in dramatic fashion, moving from an intra-quarter low of 1.63% on May 2 to 2.67% following Chairman Bernanke’s remarks. 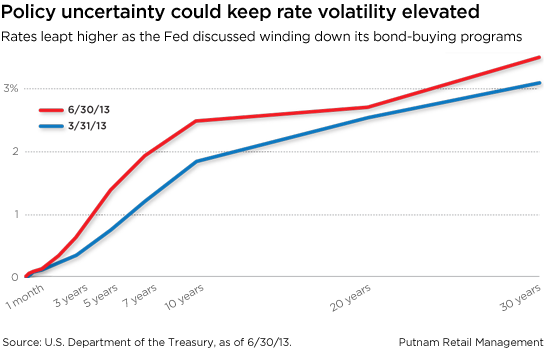 As a result of this new phase in the recovery dialogue, we believe markets will continue to see higher volatility in rates, although the range we expect in the near term for 10-year Treasuries is not high by historical standards. 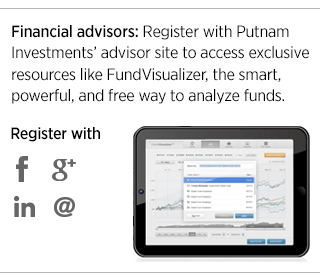 Read more in the third-quarter Putnam Fixed-Income Outlook.